The Congress protesters even made a futile attempt to march towards the tennis court at IG Park to stage a sit-in protest but were restricted midway by the paramilitary and police forces on duty. 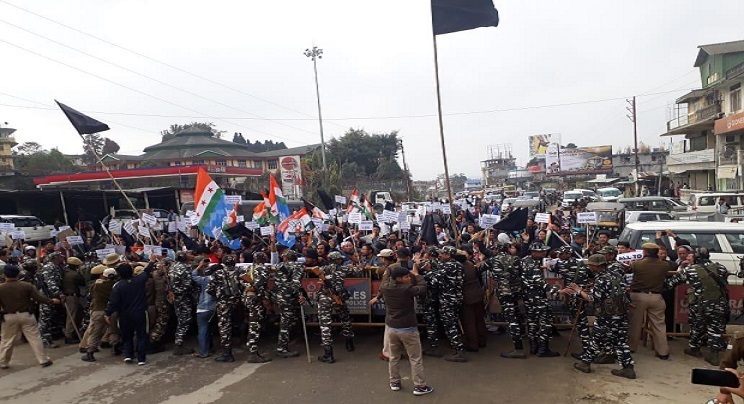 Congress in Arunachal Pradesh hit the streets of Itanagar on Saturday and waved black flags at Prime Minister Narendra Modi when had reached there to inaugurate and lay foundation stone of several projects. Shrill screams like “Modi go back”, “Scrap Citizenship Amendment Bill”, “Pema Khandu hai hai” and “Narendra Modi hai hai” rent the air when the Prime Minister started moving from Raj Bhavan to Indira Gandhi (IG) Park to attend the inauguration programme. Some of the protestors even tried to climb over the barricade in an attempt to approach IG Park which led in a tug of war between them and the security forces. This eventually also disrupted the traffic movement in the capital. Interacting with media persons later on the day, APCC spokesperson Toko Meena said Congress will never allow the “contentious bill” to be imposed in the state and would fight against it till the same is not withdrawn. “The draconian bill is unconstitutional, discriminatory and particularly against the indigenous people of the state and Northeast. It will endanger the existence of indigenous people and create communal disharmony in the entire region,” Toko said. The Congress spokesperson also came down heavily on Chief Minister Pema Khandu led state government for only black topping the road from Raj Bhawan to IG Park overnight in an attempt to impress Modi and at the same time make the people fool. “The state government has only mended the stretch of road where the PM travelled today, whereas the truth is that one cannot walk or drive properly within the Capital Complex due to the pathetic condition of its streets,” Toko said. The Congress also said that Modi’s intention to visit Arunachal a few months prior to the general elections was nothing but an attempt to garner votes by befooling the innocent people again. The Congress workers later released around 4,000 black balloons in the sky from Niti Vihar, DDK and RWD colonies while PM Modi was addressing the people. Meanwhile, the students of Rajiv Gandhi University (RGU) also boycotted PM Modi’s visit to Itanagar in protest against the Citizenship Bill and staged demonstrations at the campus. They later also burnt his effigy. The protest at the University campus was carried out under the banner of RGU Students’ Union and supported by North East Students Organization and All Arunachal Pradesh Students Union.